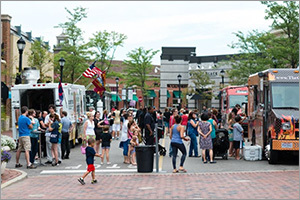 The Popular Food Truck Mondays Returns to Legacy Village on Monday, May 20th 2019 from 11:30 AM to 1:30 PM. In its sixth year, Food Truck Mondays features a diverse lineup of Cleveland's favorite food trucks that satisfy virtually any craving, including many new food trucks to 2019 series. 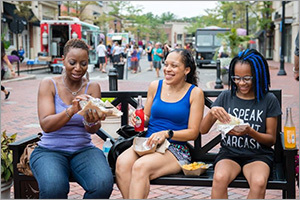 Food trucks will be set up on Main Street throughout the summer series, with a rotating schedule of food trucks returning every other week through August. Local bands will amp up the lunch hour for an atmosphere sure to chase away the Monday blues. "Cleveland is a foodie town at heart, whether it's fine dining restaurants or casual food trucks. 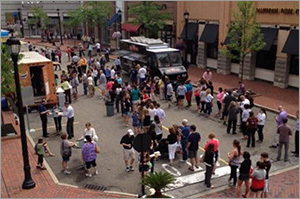 We're proud that Food Truck Mondays has grown to become one of the largest food truck series in Northeast Ohio," said Legacy Village General Manager Susan Windle. "Great food, live music and the summer sun combine to make it a great start to the work week." Food Truck Mondays kicks off on May 20th 2019 with many crowd favorites including Barrio Tacos, Chef Grey Wolf, Cookery Food Truck, Donut Lab, Off the GRIDdle, SuperHero Food Truck and The Little Piggy. Subsequent Food Truck Monday dates are June 3, June 17, July 1, July 15, July 29, August 12 and August 26 (see schedule below). The event takes place rain or shine and food trucks are subject to change. For more information visit the Legacy Village Facebook page at: https://www.facebook.com/legacyvillage . Food trucks listed are subject to change. For more information visit the Legacy Village Facebook page or www.legacy-village.com. Legacy Village is Northeastern Ohio's premier lifestyle center located in the Cleveland suburb of Lyndhurst. Legacy Village features more than 55 restaurants and retailers, many of which are unique to the area. For more information, call the Legacy Village Management Office at (216) 382-3871 or visit us online at http://www.legacy-village.com/.